Our September meeting saw our Chapter leader Jonathan away, so Annette took the reins for the evening. Pavol Rovensky led off with a lightning talk on Mocking, telling us how this works in C# rather than SQL Server unit testing. John Martin then did an impromptu lightning talk on Azure fault domains and availability sets using a pen and a whiteboard! Rob Sewell then did a talk on the merits of Control-J for Powershell snippets. Bio: Steph is a SQL Server and BI Developer working for a SaaS vendor based in Southampton, delivering enterprise class services that integrate with their customers systems. Currently Steph is leading the migration to SQLServer 2012 of a large scale solution using the whole Microsoft SQL Server Stack, making heavy use of Red Gate products to speed the build, test and deployment process. Abstract: At HTEC we had a large development team working – simultaneously – on many projects that used the same database back-end. Each project team had their own out-of-sync version of the dev database, and integrating the changes for frequent releases was agonising. We’ll walk through how we managed to get our databases into source control to painlessly manage changes and deployments – and explain the mistakes we made along the way. You’ll learn how to gradually bring your development databases under source control, as well as some of the pitfalls to avoid, and the benefits both in development and deployment. 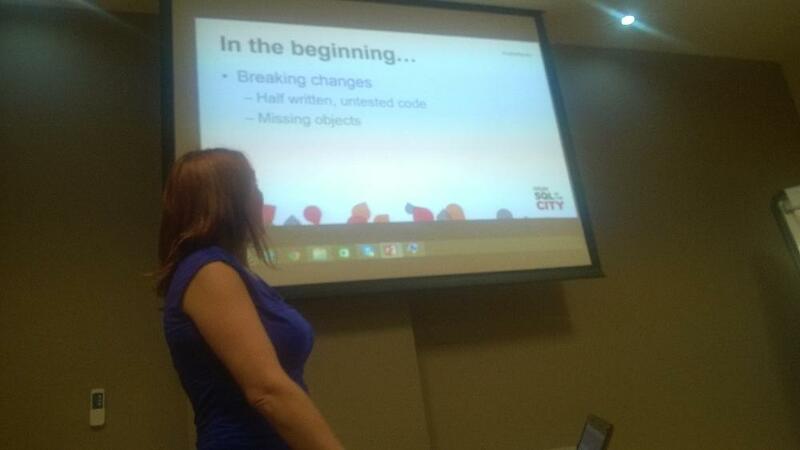 Annette Allen gave a lightning talk on Database Unit Testing. Terry McCann closed the meeting with a lightning talk on SQL Certifications, bringing us up to date with the latest changes. A great meeting, and a number of attendees finished off with a meal in Exeter to chew over any left over questions. This entry was posted in Meeting on September 25, 2014 by d_a_green.